← Skill shortage, training shortage or job shortage? ‘Carthage’ by Joyce Carol Oates. Joyce Carol Oates’ brilliant novel ‘Carthage’ carries the reader along on a compelling looping, zig-zag narrative which starts and finishes in the heart of a sympathetic comfortably-off family in the small upstate New York town of Carthage. Along the way, Oates drags us through extraordinary highs and lows in a thorough exploration of the human condition. This is not a book about 9/11 or the dehumanising effects of combat in the Iraq war, neither is it a dissection of love, jealousy or family dysfunction. All these have their place here but they are the context for what is a powerful story of a young person struggling to find meaning in her life. Cressida Mayfield belongs to that endlessly fascinating character-type, the ‘gifted misfit’ going off the rails. Examples of the type abound in great American novels, whether explicitly of the ‘coming-of-age’ genre or not. Super-sensitive, highly intelligent, intense, principled, vulnerable, remote and emotionally inaccessible, Cressida finds it difficult to negotiate her place in the world and yet she is as capable as anyone of experiencing emotion. This is a small but significant moment in a big turbulent story and Cressida’s tentative enthusiasm and burgeoning confidence are a joy to behold. Unfortunately, the experience doesn’t end well. Cressida Mayfield reminded me of Meredith ‘Merry’ Levov from Philip Roth’s wonderful novel ‘American Pastoral’. Growing up in New Jersey, Merry is Seymour ‘Swede’ Levov’s highly intelligent and much-loved daughter who goes on to commit a terrorist act as part of an anti-Vietnam war protest. The consequences of the young characters’ alienation are far-reaching in both novels but the wider social fracture is woven into the human drama more explicitly In ‘American Pastoral’ set in 1960’s America. To what extent are the difficulties faced by these gifted and sensitive young characters affected by their environment or upbringing? If the society around them was a little less complacent or materialistic and a little more idealistic or morally consistent, would things have been different? The struggles of these characters make great stories because we can identify both with their alienation and with the dismay of those close to them who are just trying to do the right thing. 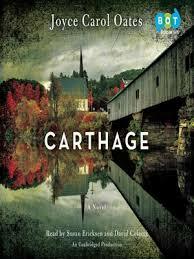 I strongly recommend ‘Carthage’ and, of course, ‘American Pastoral’. This entry was posted in Culture, Reviews and tagged American Pastoral, books, Carthage, Joyce Carol Oates, Philip Roth. Bookmark the permalink.